Life can be disappointing. Sometimes disappointments are the product of poor decisions, and sometimes they seem to have no reason at all as we suddenly find ourselves facing a situation we never expected, or wanted, to face. With compassion and truth, Pete Wilson discusses suffering and hardship, and how we can seek honest and biblical ideas of God during those times of difficulty. Pete Wilson fills the pages of his book with personal experience, real life stories, and biblical characters, using these to draw the reader into a thoughtful conversation about how our perceptions and misconceptions affect the way that we see suffering. A discussion guide is included, making this book great for both individual and group use. Reading Plan B felt like sitting with a friend discussing a difficult topic. There is pain in addressing questions that we would all rather avoid, but the pain is softened by the company. I appreciate the way that Pete Wilson uses biblical examples throughout this book. Instead of saying look at this example to see how you should be behaving, he shows how biblical characters feel and behave in ways similar to us today. God was still with them, and He is still with us. There are no easy, simple answers when people are suffering. And Pete Wilson isn’t trying to give any. If you have ever felt lost in your own life, if you have wondered whether God is still paying attention, or if your life will ever feel normal again, Pete Wilson’s book will encourage and comfort without condescension or condemnation. I highly recommend Plan B. 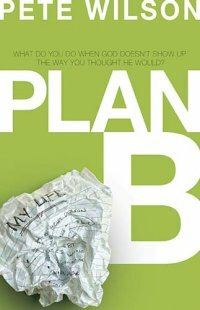 Plan B retails for $14.99 and is 226 pages in paperback. Below are purchase links. This entry was posted in Book Reviews and tagged Book Review, faith, Pete Wilson, Plan B, Suffering, Thomas Nelson. Bookmark the permalink. Your welcome! 🙂 And thanks for stopping by. This has been a very applicable time in my life to read your book. It has been stirring a lot of thoughts and conversations with God in my heart and mind. I was born in Australia but grew up in England strattera cost operating procedures of the practice setting.